in a shed on the premises of my butcher. He has so much land, that there are all kinds of little shops popping up. 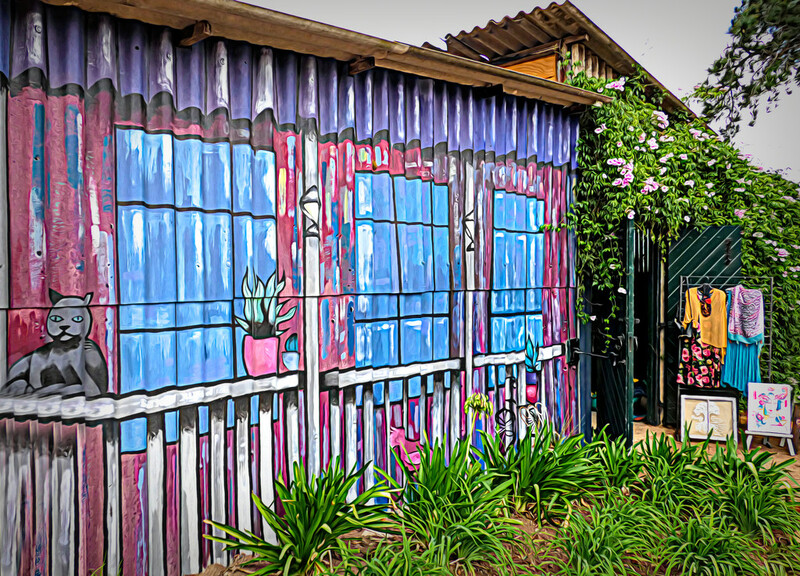 I loved the painting on this corrugated wall. The wall is so bright and cheery and I love this editing! That certainly brightens up a utility building.!! This is cool, I would have to check it out. Looks and sounds like a cool place to shop. Colourful and interesting, nice find! I have to agree that is a very intriguing paint job! Love the paint effect. I must go out that way soon. It's always a joy to visit. Nice street art. Great find and shot. that cat is a bit creepy for me. lovely colours! @koalagardens @julzmaioro @gigiflower @momamo @ellida @777margo @joansmor @louannwarren @onewing @hrs @jacqbb @henrir @grammyn @vstrom @kwiksilver @lynne5477 @pyrrhula @rickster549 @summerfield Thanks for the kind comments, they are very much appreciated. Wow, how colourful, and I like, how you processed it.